I have been making water-soluble polymers with biomedical applications for the last 16 months and it is quite satisfying: Our macromolecules are usually well behaved – they extract into organic phase. They precipitate as a snow-white fluffy crystalline solid, on a kilo scale. They even have beautiful NMR spectra. Unfortunately, such was not the case with the frothy mixture in the picture. I had to isolate the material from a solution in concentrated HCl (0.3L), with extra sludge of inorganic salts and assorted gunk that included gram quantity of dimethyl sulfide. The usual process would be: dilute, filtrer, dialyze. But dialysis is a slow and rather frustrating business and we don’t even have bags giant enough for removing few mols of salts and HCl. So I was delighted to learn that tangential flow filtration is a turbo-alternative to a dialysis – instead of steeping a swollen dialysis sausage bag (that can burst overnight) for days and waiting for the diffusion to run its course, the tangential flow filtration setup visibly labors for you: the pump pushes the mixture against a semi-permeable membrane, water and other small molecular weight material leak out, the macromolecular fraction stays in. The purification is done in few hours. 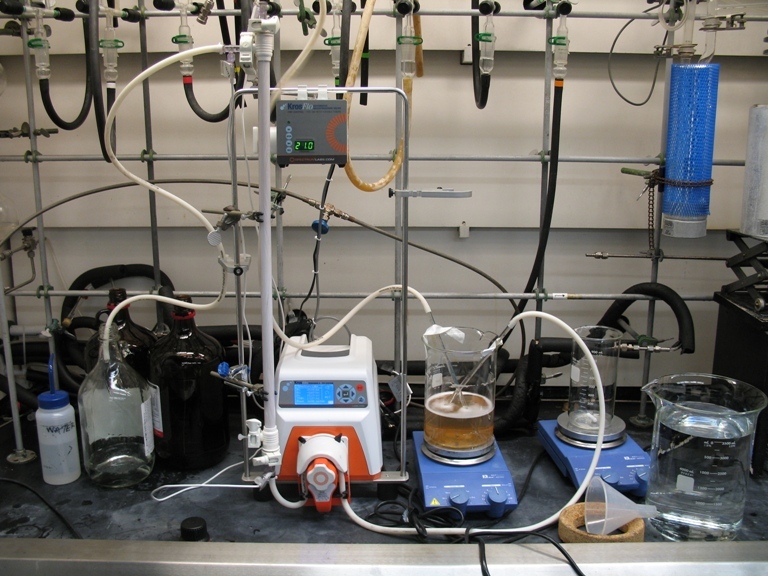 The peristaltic pump in the picture circulates the crude mixture at moderate pressure and high flow rate (20 psi, 1.7 L/min) from the beaker to bottom of the column; the stuff that flows out at the top is fed back into the beaker in a closed loop. The column consist of a bunch of spaghettini-like capillaries that are coated with a semipermeable membrane. The spaghettini are housed in a plastic pipe casing. It is inside these capillaries that the mixture rushes through at high speed over and over again – water and small molecule material that leaks out through the walls of the capillaries collect in the casing and flow into waste (the sidearm and the transparent bottle). One has to keep adding water into the beaker quite often because with a good column + pumping rate/pressure the mixture gets concentrated rather quickly.